“Look behind you” – the pantomime season is upon us! “Look behind you” might have taken on a different meaning for Richard Pearson while at the helm of Solent Sunbeam Dainty V1 during the Les Voiles de Saint-Tropez race in October. 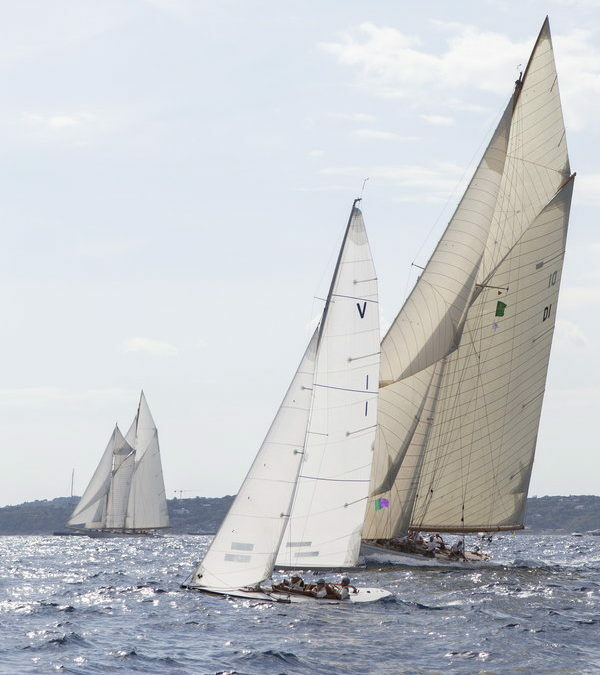 Dainty was about 2 hours into a 5 hour beat towards the Nuarlargue bank turning mark when the skipper of the 15 Metre Class D1 Mariska came close enough to enable a wonderful sequence of photos to be taken as he overtook her. Mariska D1 is the first of the 15-Metre Class, designed by William Fife III, built in mahogany in 1908. Of the 20 built in this class between 1908 and 1917, she is one of only four remaining. View the sequence of images in high resolution at https://1drv.ms/f/s!ArcV6ntJRADDhEL74tFzUkndsWjj (a OneDrive safe link). We are grateful to the marine artist Jamie Medlin for his sequence of photos from a RIB.